K9 are giving away a free Vivog low level electric table and an Allbrooks Tornado Take Off with all conversion orders placed by the end of June. 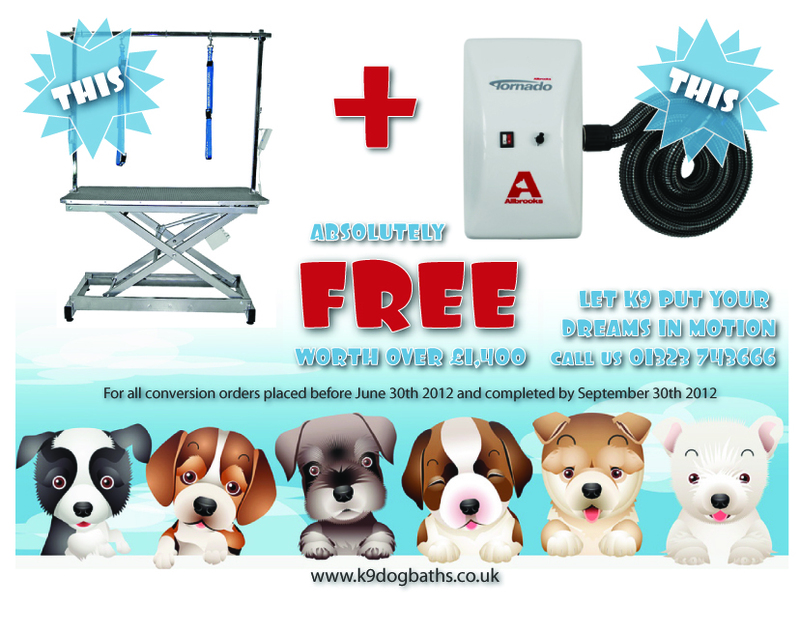 Quick, hurry there are limited spaces available to take them up on this fabulous offer get in touch with them on 01323 743666 or alternatively visit the website http://www.k9dogbaths.co.uk. Grooming your dog or cat is now part of many owners daily routines; in fact many people spend more time making their pets look beautiful than they do on themselves. We have compiled a list of our Top 10 grooming products from a range available at Love Pets. We hope this list will be helpful for you if you are currently planning on extending your grooming products range, or even if you are just looking to try something new out on your pet. You can learn more about the products and purchase any of them by clicking on the product links which will take you to the relevant pages. The Groom-It Deshedding Tool is one of the most popular, effective and essential products on our website. It takes off so much loose, dead fur, with absolutely no discomfort for your pet at all, and will leave them with a beautiful, shiny, healthy coat. This product is available in two sizes and is suitable for both cats and dogs. This is a great collection of clipping and trimming items that will help make what can be an awkward job into a much easier and enjoyable one. The varied length trimmers that are in this set means that it will cater for all breeds and all areas of the animal’s body that you wish to tidy up. The set includes a high quality brush and a Crystal Gleam Coat Shine Spray to add the final touches to your pet’s mini makeover. The Furminator is another excellent grooming product that removes loose hair and reduces shedding by up to 90%! It helps bring out your pet’s natural oils when it is being used as well as reducing the likelihood of allergic reactions or infections that may be caused within the dead hair. The Furminator is available in three different sizes, so you can judge on the size of your pet which one will be best suited to your needs. The Wahl Complete Grooming Kit contains everything you need to give your pet a trim. It is suitable for dogs of all sizes and will help you to create a healthier and more stylish looking pooch. The package is superbly priced at just £36.45, which is great value and includes the attractive grooming bag as well. The kit is light, small and quiet which is ideal for nervous animals and can be used for trimming the face, ears and paws. This product has been developed to help maintain a dog’s healthy skin and coat. It provides your dog with the essential natural oils to reduce moulting, improve dry and flaky skin and improve coat condition. 14 out of the 21 Crufts finalists are users of this product, which highlights just how effective it is in ensuring dogs look at their best! The Moult Master is another popular grooming product that is highly effective in removing dead and loose hair from the coat. The Animology Shampoo Set contains three great products; the Dirty Dawg, Stink Bomb and the Animology Dogs Body. These products are suitable for dogs of all sizes and breeds and are high quality items that will be sure to keep your dog fully clean and hygienic. Every dog owner needs a good pair of nail clippers these days and this pair from Mikki is one of the best on offer. These clippers are very easy to use and ensure that even dogs that can be a bit edgy when having their nails clipped are put at ease. The clippers are available in different sizes and even the large set are priced at under £10 at LovePets.co.uk. Another superb product from Yumega is this which is specifically designed for dogs with itchy or sensitive skin. It contains a natural blend of Omega 3 and 6 oils from cold pressed golden flax starflower and fresh salmon oil. This product is proven to be effective and it won’t take long for signs of improvement to show if you use this product correctly. The ByoFresh Grooming Pack contains a number of innovative products, including shampoos, sprays and wipes. They all contain a revolutionary new disinfectant called Byotrol, which has the unique characteristics of being powerful, long lasting, but still gentle enough to use on your pet. The pack contains 2 x Dog Grooming Wipe Packs, 1 x 350ml Evening Primrose Dog Shampoo, 1 x 125ml Evening Primrose Deodorising Spray and 1 x 500ml Stain and Odour Remover.